After all of the excitement of the holidays and ushering in a promising new year, there might be nothing worse than getting sick. Just as you’re trying to get back on track at work after a few days off, the last think you need is the runny nose, sinus pressure, and terrible headache of a bad cold that leaves you desperate to stay in bed. But don’t worry; we’ve got you covered. While it may be impossible to ward off every germ you’re exposed to this winter, we have some tried-and-true methods of avoiding illness that should go a long way toward keeping you healthy. Read on for some natural ways to prevent a cold or flu virus from getting the best of you. Using soap and water regularly throughout the day can strip your hands of the germs that are so easily transferred internally when you casually touch near your eyes, nose, or mouth. (If your hands tend to get dry in the cold winter months, keep some moisturizer nearby because frequent washing can make the problem worse. But it’s worth it.) Just don’t substitute hand sanitizer for a sink washing. The antimicrobials they contain have been linked to the development of breast cancer. All liquids are not created equal, so even if you like a little coffee or juice in the morning, make sure you drink plenty of water throughout the day. Remember, coffee is a diuretic; it drains water out of your body. And juice is high in sugar. Aim for 64 to 96 ounces of water daily to ensure you are properly hydrated. Water helps flush toxins from the body and keeps mucus thin if you do happen to be fighting off a cold. Garlic is a tasty herb that adds quite a bit of flavor in dishes. But even more than that, it is a potent infection fighter that can help you stay healthy this winter. Of course, you’d probably prefer not to walk around smelling like you just chewed on a clove, so you’re probably better off taking a supplement. A 2014 study at the University of Western Australia in Crawley found that daily supplementation with garlic was associated with fewer than half the number of colds as occurred in non-garlic takers. 4 And that’s why garlic is a primary ingredient in Jon Barron’s Super ViraGon. 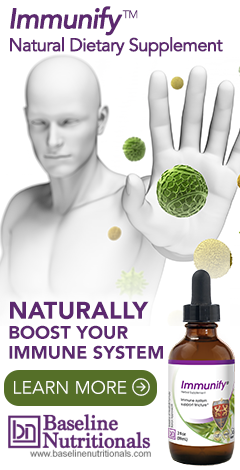 There are a number of herbs and nutraceuticals that can help power up your immune system. For example, studies have shown that Echinacea can reduce your chances of getting a cold by up to 58%, or shorten its duration if you get one by 1.4 days. Other immune boosting herbs include, suma, pau d’arco, and astragalus—all of which are found in Jon Barron’s Immunify. If you do end up with that telltale scratchy throat or nasal congestion, there are natural remedies that can lessen the duration of your infection. To learn about the best options for getting better fast—as well as what to avoid—check out Jon Barron’s How to Fight Colds, Flus, and Infections. 1. Nieman, David C.; et al. "Upper respiratory tract infection is reduced in physically fit and active adults." British Journal of Sports Medicine. 1 November 2010. Accessed 20 December 2016. http://bjsm.bmj.com/content/early/2010/09/30/bjsm.2010.077875.abstract?sid=fe62a8c5-430b-4506-b854-20b62e8a5e9e. 2. Prather, Aric A.; et al. "Behaviorally Assessed Sleep and Susceptibility to the Common Cold." Sleep. September 2015. Accessed 21 December 2016. http://www.journalsleep.org/ViewAbstract.aspx?pid=30153. 3. Barrett, Bruce; et al. "Meditation or Exercise for Preventing Acute Respiratory Infection: A Randomized Controlled Trial." Annals of Family Medicine. July/August 2012. Accessed 21 December 2016. http://www.annfammed.org/content/10/4/337.full?sid=48dba568-66ef-448d-bed4-1a3a6e0e76f6. 4. Lissiman, Elizabeth; et al. "Garlic for the common cold." Cochrane Database of Systematic Reviews. 11 November 2014. Accessed 22 December 2016. https://www.ncbi.nlm.nih.gov/pubmedhealth/PMH0013804/. 5. Sanchez, Albert; et al. "Role of sugars in human neutrophilic phagocytosis." American Journal of Clinical Nutrition. November 1973. Accessed 22 December 2016. http://ajcn.nutrition.org/content/26/11/1180.abstract. thanks for sharing very useful information your article is very nice.i have daily visit on your site. You could have added intake of plenty of citrus fruit juice also to prevent frequent bouts of colds. For example, during colds if we take fresh lime juice with hot (tolerably) water frequently, then duration of colds can be shortened, and body also does not feel much symptoms of colds. I feel like many people are unaware of the immune benefits of exercise, so I was really glad to see it here. But I was even more excited to see you mention garlic! My mother always hailed garlic as the natural antibiotic that doesn't have any negative side effects (well, except for bad breath). After doing some research, I found she was right. All of garlic's antibacterial, antiviral, anti-inflammatory, and immune-boosting properties sure make a case for garlic being a medicinal superfood. Definitely an excellent inclusion here! Thanks for all your excellent posts Dr. Kalitenko! I wish Beth had listed the BEST way to prevent the Flu is "Do Not Touch your T Zone" (Mucus membranes of the eyes, nose and mouth) It is the ONLY portal of entry into the human body for ALL respiratory infections! Visit henrythehand.org for more about the 4 Principles of Hand Awareness. I found the information is this article to be very informative. I don't think people realize how much of a difference these little things can make! Some people seem to neglect the fact that daily exercise can help strengthen your heart and immune system. They also seem to ignore that washing your hands as much as possible can help prevent the spread of germs greatly! Thank you for sharing your information with us!